Wild Boar Polaris Ranger Full Size 570 Crew W/ Lights & Winch Mount Rear Bumper $305.00 FREE SHIPPING! Wild Boar Polaris Ranger 900/1000 (13-17) Rear Bumper W/ Lights & Winch Mount $299.00 FREE SHIPPING! 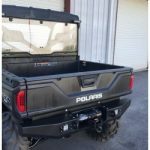 Polaris Ranger 900/1000 Rear Bumper w/ Lights & Winch Mount! Wild Boar Strives to build the best bumpers we can. The Wild Boar Mid-Size Ranger Front Bumper replaces your stock bumper. These bumpers are build with extra support beams to help support up to a 4500lb winch. Never worry about seeing in the dark with our LED cube lights built into the bumper. Polaris Ranger 900/1000 W/ Lights & Winch Mount (13-18) Rear Bumper- FREE SHIPPING!